Your daughter is one of the most important person in your life, bringing you happiness, joy, love, and so much more. And while every one of her birthdays is cause for celebration, she deserves nothing but the best for her quinceañera. Your daughter’s quinceañera will be one of the most important days of her life. But actually planning a quinceañera can be quite the challenge. Thankfully, De Luxe Banquet Hall is here with a helpful quinceañera planning guide. Read on for our tips and advice on how to plan the perfect party. The first part of any party planning process is determining your budget. A big event like a quinceañera will require plenty of spending, from renting an event venue and hiring catering to selecting invitations and your daughter’s quinceañera dress. And those costs are going to add up quick. With a clear budget in mind, you’ll have a great idea of where to spend and where to save, eliminating much of the stress that comes with quinceañera planning. The perfect date is essential to the perfect party. To make sure your daughter’s celebration is a huge success, be sure to decide the date early. We recommend checking with family and friends to see if there are other major events in the near future, that way you can be sure that there are no conflicts. Consider deciding the date at least four months in advance, giving guests plenty of time to adjust their schedules for your daughter’s big day. What kind of quinceañera event venue do you want? Will you observe any traditional quinceañera traditions? What kind of catering do you want for the party? You’ll cherish the memories from your daughter’s quinceañera for the rest of your life, and to help you capture those moments you’ll definitely want to hire an event photographer. The right photographer will be able to capture stunning candid shots and beautiful formal photos of your family, friends, and loved ones. If your daughter wants to honor tradition, then she’ll definitely have a quinceañera court at her party. The court celebrates the night alongside your daughter, and is comprised of 14 of her closest friends. Naturally, your daughter should choose her own court, but you want to be sure she chooses wisely. The ideal quinceañera court will support your little girl throughout the planning and preparation process, helping shine a spotlight on her throughout the night and making the event truly memorable. A quinceañera signifies your daughter’s transition from childhood to adulthood, and that means she should start acting like an adult. To help teach your daughter the value of gratitude, be sure to help her craft thank you notes following the party. Thank you notes are a great way to show guests that your daughter’s appreciates them, strengthening her bonds with guests. 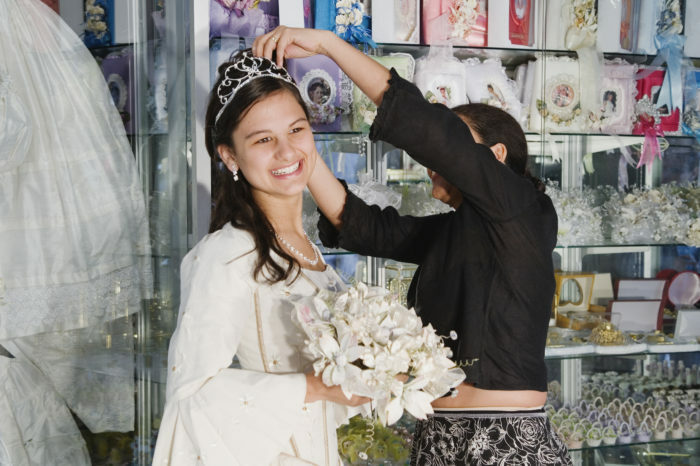 Planning a quinceañera is a massive undertaking, but in the end all of your research and preparation will be worth it. Remember, this is a big day for your daughter, and your careful planning will definitely make her happy. If you’re looking for a quinceañera venue in Los Angeles, consider De Luxe Banquet Hall. Our event venue is perfect for a variety of social events, from quinceañeras and birthday parties to anniversary celebrations and more. Contact De Luxe Banquet Hall today for more information on booking and availability.